I absolutely swear I have never ever said this about any salad or salad dressing in the world. Honestly. No fingers are crossed and my right hand is over my heart. I am also a Girl Scout leader so you can trust me 100%. I have said that about chocolate more times than I can count, but I’m not really a lick your plate kind of salad girl. This one is so good that almost every guest at my sister-in-law’s dinner party exclaimed, “This salad dressing is delicious…what’s in it?” There was not a single bit of the salad left in the large bowl. For this wonderful dressing and it’s amazing salad, I must give full credit to Aarti Sequeira of Aarti Party from the Food Network. I have been Tivo-ing her show ever since she won Food Network Star, and she is not only a natural on T.V., but her food looks delectable. Now I can positively say that her recipes W-O-R-K. 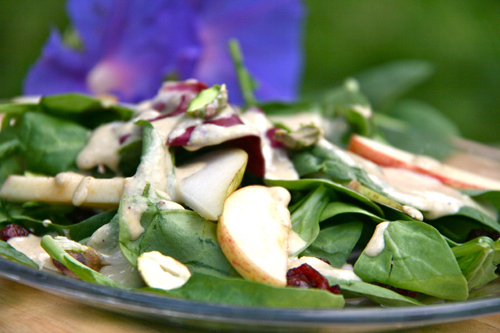 The pistachio dressing tastes so creamy that you would swear there is some cream or milk in there somewhere. But no, there is not. 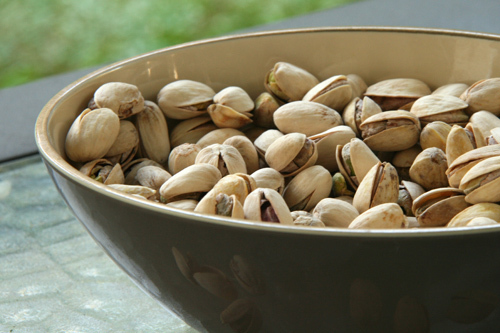 Just wonderful toasted pistachios, canola oil, water and lemon juice make up this emulsion. 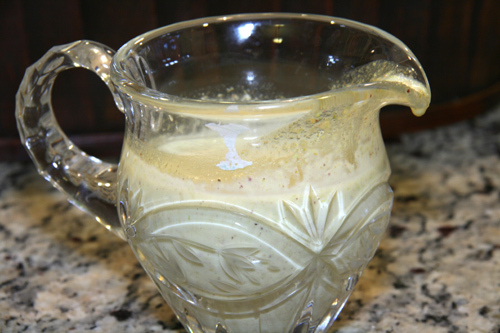 This dressing is TO DIE FOR, and I think it is very versatile and would be delicious over chicken as well. The recipes for the “Ugly Duckling Salad” can be found on Food Network but I made one change since I couldn’t find celeriac. 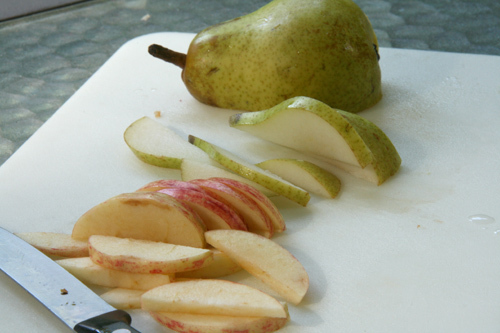 Instead, I put in thinly sliced pears and added dried cranberries. My salad was such a beauty that I don’t think anyone would have called it an Ugly Duckling! OK….today at this blog you get two posts for the price of one! You haven’t been paying? You were supposed to be sending me $$$ for each time you read a post…hmm. Anyhow…I will get on to my exciting news!!! 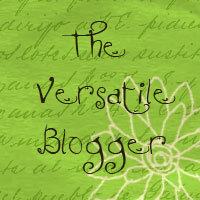 I was selected by one very sweet blogger, Janna, of Try It You Might Like It for the Versatile Blogger Award. Cool. What that is exactly I am not sure, nor do I care. I haven’t won anything since I was in school! YIPPEE! Janna, would you mind sending me a certificate or something I can hang on the wall at work? WHAT?!!! There are no certificates for this?! Hm…that’s something I will work on. Anyhow there are rules to this award. The rules are simple—I must talk about the person who nominated me, talk about myself, and bestow the award on 10 other bloggers. I am, if nothing else at all, a rule follower. Boring, I know. Although somewhere out there in the world someone just laughed aloud. I guess I follow rules if they make sense to me. Rules that don’t make any sense at all morally, logically or emotionally aren’t really rules if you ask me. So here are the rules to this lovely, amazing, imaginary award…. 1)Mention the person who nominated me: Hi Janna, that’s you…everyone please check out her blog, Try It You Might Like It. I have tried it, and I LOVE it and there’s a beautiful pumpkin pie recipe on it today. 1. Food – I wish I could tell you I was picky, or had things I don’t like to eat, but that’s just not how it is. I really love all kinds from all cultures in all flavors, you get it. Chocolate is the best food of all though! 2. 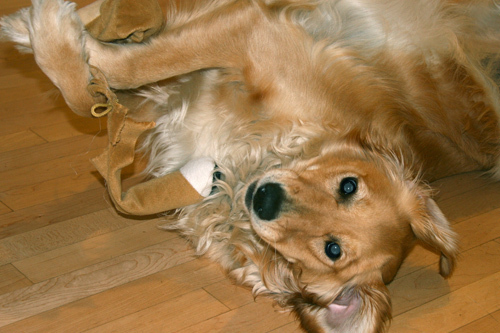 DOGS–Sadie rocks my world…check out famous Sadie pics on previous posts. 4. Movies– Absolutely adore Almost Famous and Sound of Music. 6. Kids–uh oh…i am breaking the rules Janna :). I love all kinds of kids; my own, other peoples’, strangers’ kids in coffee shops, little ones waving at me from across a restaurant, big angsty ones–you get it. 7. BLOGS–yep, I love reading them and pretty much enjoy writing one. 8. The idea of traveling (I don’t get to as often as I would like). 9. The Ocean–the sound especially. 1. Dan from Island Eat: I love that he does a post each week from his grandmother’s recipe box along with fun black and white photos of her. I feel like I know her, and she’s a kick! 2. The Broken Ganache: This is a beautifully photographed blog of the most delicious looking chocolates and candies I have ever seen. 3. The Seven Hills Collection: Leah is just funny and interesting. I would love to live next door to her, eat her awesome homey food and have doggie playdates. 4. Drexelius Chocolates: Molly is a certifiable chocoholic. So much so that she sells it, blogs about it, and generally shares her knowledge of it with the world. Rock on Molly! 5. Blackbook Kitchen Diaries : Stunning photos and equally delicious looking food. 6. Captured Moments by Mel: She is such a talented photographer and sweet person and her blog reflects that. 7. 17 and Baking: She’s an eloquent writer, an amazing baker and has a big heart. I love Elissa’s blog. It’s the reason I started blogging. 8. Nye Noona: Another fantastic photographer, and she loves animals and nature. Stopping by her blog is a treat. 9. Stay Calm: Have a Cupcake! : Need I say more? 10. Simply Life: She has delectable looking food and lovely photos. So the rules of being a Versatile Blogger are pretty simple: Talk about the person who nominated you, talk about yourself (the newest Versatile Blogger), and bestow the award upon 10 other bloggers. Two great posts in one…plus a nomination? Huzzah!!! Gotta check out some of your these blogs…and try your recipe. Thanks, Geni! You will absolutely love the other blogs so have fun. I still have some it the fridge if you want it! Sadie rocks my world too. I like salad. I will tell Sadie! 🙂 I’m so glad you like salad. You have such an extraordinary palate Linds. It looks so pretty, I can’t believe that anyone would call it the Ugly Duckling Salad. I love salad and would never have thought to put all that in there, I’ve to give this a try. Thanks for the award – you’re so sweet! 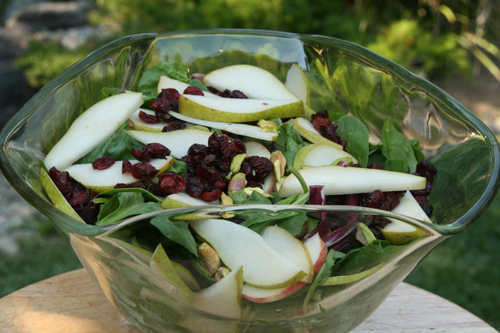 Oh and this salad looks amazing! Reading your blog always puts a smile on my face. Life really can be fun. Great recipes, wonderful photos & fun reparte what more can I ask for. Thanks very much, Geni!! I appreciate the award and now want to try your salad dressing. It looks really tasty. Any time! I always love reading your blog.